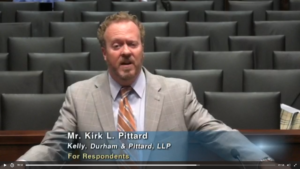 Kirk Pittard is in the Texas Supreme Court-again! - KELLY, DURHAM & PITTARD, L.L.P. Kirk Pittard is in the Texas Supreme Court-again! 2018 begins the same way 2017 ended for KD&P partner, Kirk Pittard–by arguing before the Texas Supreme Court, this time in an important family law case, In the Interest of H.S., in which the Court must decide the statutory standing requirements necessary for a non-parent to petition the court to alter parents’ decision-making authority over their children. Links to the parties’ briefing can be found here, and a link to today’s oral argument can be found here.